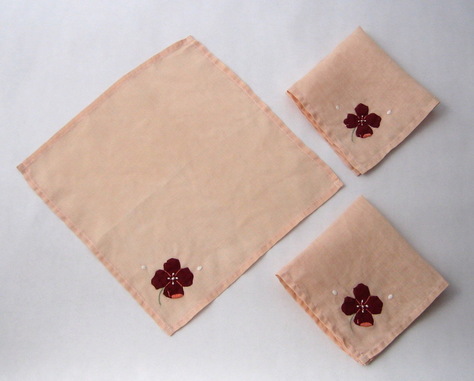 Delicate linen napkins that belong at a ladies tea or luncheon on the terrace. Pale peach ground is decorated with a burgundy appliqued pansy and peach, white, and celadon green embroidery. 3 are in excellent condition. No tears, holes, stains, or pulled threads. 1 is excellent except for tear (1.25") on ground, so is no longer suitable as a napkin. Would make a lovely "scrap" for quilt or other sewing project.